In the adjacency list model, each item in the table contains a pointer to its parent. The topmost element, in this case electronics, has a NULL value for its parent. 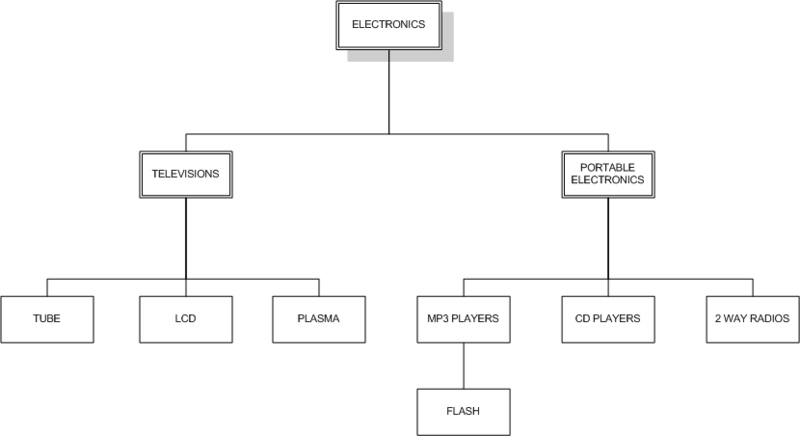 The adjacency list model has the advantage of being quite simple, it is easy to see thatFLASH is a child ofmp3 players, which is a child of portable electronics, which is a child of electronics. While the adjacency list model can be dealt with fairly easily in client-side code, working with the model can be more problematic in pure SQL. Very nice and concise article, Mike. I bought Joe Celko’s book that you referenced and have skimmed, then read it. Your article helps me to understand the Nested Set model. I’m an old dog who has been writing adjacency list hierarchies since the early nineties. I always thought there could be ‘better way’, and this is certainly it. Thanks for taking the time to explain it all, Mike. Could this be made to work for hierarchies where a child can have more than one parent? thanks for your well described tutorial. I noticed you do a “GROUP BY node.name” in quite a few example queries here. This is very bad practice and will return some unexpected results as soon as you have a few hundred records where node.name is not unique anymore. You should group your rows by ID instead. I am a beginner php programmer and want to develop a mlm web application in php & mysql,but I have no idea about it. 1.It work on binary tree in which every node only have left and right child. 2.In this we can add node as our wish which be add in left or right. So how can implement it? I use this data model for years. I first found it on dev.mysql.com few years back. I have structures many levels deep and data with hundreds of rows – It never fails, it’s really fast. The ability to cut part of the structure with one question is simply awesome! It is part of my framework now with full credit to Mike of course 🙂 Thank you so much for sharing. How do you manage inserts? I beleive you would have a programmatic way of doing inserts. Most online resources on this subject start from “pen-paper”, as in, number nodes/elements by hand and then fire individual inserts. Is there a resource that takes in a tree/xml and generates the numbering? I like your code for “Retrieving a Single Path” in a “Nested Set Model”. However, how would you retrieve a single path if there were multiple nodes with the same name? For example, what if Flash was listed both under MP3 Players and under Movie Characters, and you wanted to retrieve the path that led to the movie character only? Your adjacency model is super close to what I need. Is it possible to perform the “retrieve a full tree” query and have the number of “children” be dynamic. Your example will work great if you have =1 levels. In your demonstration of inserting a row between ‘Televisions’ and ‘Portable Electronics’, what if the table was extremely large, perhaps hundreds of thousands of rows, and the left insert point were very close to zero? Unlike an adjency list, such an insert into a nested set will trigger massive updates. It seems to me that a good extension to the model might be to reserve space, perhaps depth dependent, so insertions trigger less expansive updates. Very useful article – I had to do some digging, as this article recently vanished from mysql.com for some reason. The formatting of this article on your blog is somewhat broken – it would be nice if you could clean this up so it’s legible again. Thanks! Firstly, huge thanks for a great & clear explanation. I implemented some of your code examples against a database I’d generated of a hard disk directory structure and got some strange results. In the examples you’ve given, you’re using ‘GROUP BY node.name’. However, if I understand things correctly, this will only work if ‘node.name’ is unique for all entries. If, as I discovered, you have multiple entries with the same ‘node.name’ then doing ‘GROUP BY node.category_id’ seems to work. +1 to you Mike, I had the same table schema but implemented the retrieval stuff in PHP code which was a bit slow (I used it for categories on a retail store portal). I was looking for an idea about hierarchical retrieval via SQL queries, and you gave me a great food for thought. AND the Question IS HOR TO GET LIKE THIS ? Great article, I looked for it on dev.mysql but it’s not ther anymore. 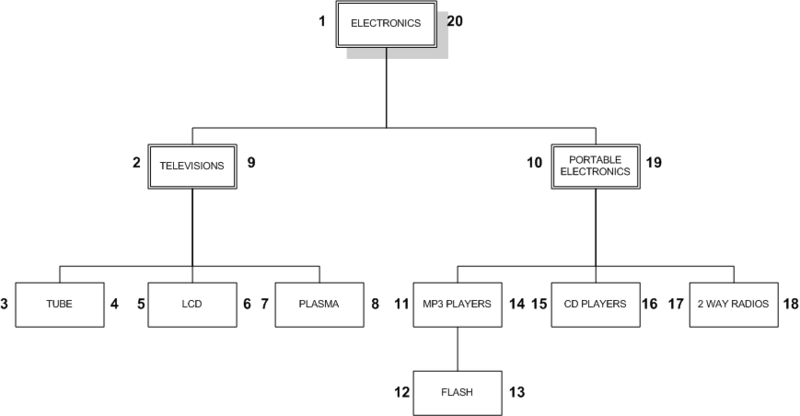 Let’s say you have in table also position INT field, that let’s you sort nodes that are on the same level, in your example let’s say I want “LCD” to come before “TUBE”, or I want “PORTABLE ELECTRONICS” to come before “TELEVISION”. Is it still possible to retrieve the full tree with one single query as in your example, but with the nodes already ordered also by position? Cause I think adding just ORDER BY position at the end of the query would not be a solution. Great article Mike! I have a menu structured in the adjacency list model and I needed to retrieve a single path where the last node could be at any level. I ended up writing a stored procedure that would return one string the different nodes separated by semi-colon and have PHP parse that string. If I may point one possible improvement over your model. When you do your SELECT and GROUP BY statements, to use the ID instead of the name. Imagine you have child nodes with the same name, but different parents. 1) It’s okay to have credits hole in the series? 2) is this a good idea? 3) what is the easiest way to convert a tree to a Nested Set? Suppose i want to search the category with like query ‘%s%’. Now s is in 3 level (Level1 = Music),(Level3 = Michael Jackson ),(Level5 = Thriller – Song ). Now its give me 3 results instead of 1. How i will get 1 results? If i found the result at first level(levle1), it will not search at second level (level2). if i found the result at Second level(levle2), it will not search at Third level (level3) and so on. Thank you in advance for this article. Could you show how to add new root nodes ? ‘ORDER BY parent.lft’ as opposed to ‘node.lft’. If we look at the Retrieving a Single Path section, it does not make sense to order by node.lft, since node.lft is all the same tuple (we’ve queried for a node.lft=’FLASH’). I have set up my page with nested tree. But the biggest problem is still when I add a new category/subcategory. Afterwards you have to renumber all articles in your database because most of them got a new category number. If you have 500’000 acticle this takes long and all your references change too. I wonder how ebay is doing this? You can’t stop trading while updating. Hello Heinz, look at Trees and Hierarchies in SQL for Smarties to get a lot of advanced tips. One I can share here is to look at using index numbers that increment by 1,000 instead of by one, when you need to add a node you place it between two existing index numbers, then occasionally during slow periods you re-index everything. very nice article. But now i have a question. how can i receive directly a specified depth of a optional parent? For example, i choose PORTABLE ELECTRONICS as the parent and i want to get the depth:2 which will be resulted the FLASH. First compliments on article – it’s really straight & forward explaining approach concepts of building hierarchical model in RDBS. will chock a query on performance in mega volume sets. We’ve built an Enterprise marketplace product and converted from Adj. to Nested. It’s incredible how fast result sets are accomplished with the proper query. While the queries in this article work they are definitely not large-category + huge product volume set ready.. everything works great with < 1,000 products and/or < 10,000 categories. categories table contains 28,301 categories. Without it a category with 11,000 items results in 18 seconds delay. With the ON clause to the parent table join reduced it to < 0.1 second. It's blazing fast. We've also added necessary single and combined indexes which also help I'm sure. Hello friends. I’ve just switched from Adjacency List Model to nested set model. I’think i’m starting to understand what is going on, but i have big problem – i cannot draw my tree as html menu. i found some sources/examples (http://stackoverflow.com/questions/1310649/getting-a-modified-preorder-tree-traversal-model-nested-set-into-a-ul) on the net, but it’s a little hard to me to port them to work with Your examples. Can anybody help me with that? Thank you. Just wanted to thank you for the article. I was working out ways to best get results from a nested set and my mind was turning to mush. Luckily I had a read through this article and all became clear. Hi, I’ve implemented nsm in my project, thanks to this article. Now I’m trying to get a simple method of showing all (lets say) products) of given parent category (which can contain many subcategories). Is there any chance to somebody give any tip on how to acheive this? part of the WHERE clause. The query will find the path to the root. I tried Retriving a single path and your query didn’t worked. I changed ‘ORDER BY node.lft’ to ‘ORDER BY parent.lft’ and worked. My mysql is 5.6.19-1~exp1ubuntu2. Excellent work! thanks a lot. I find this is problematic, cause if I add two item with the same name will cause the depth got a wrong result..plz help me.. This gives Game Console left=10 and right = 11, while right of Television remains 9. Resulting a corrupted tree. Instead, you can select @myRight := rgt – 1, and rest of the query would work fine. There is a further improvement to this model where you store the depth with each node. That makes querying for sub-trees and adjacent entities far simpler. In symphony there is a nested set library available for doctrine (which I have used) and there’s also a php lib called Boabab (which I haven’t). How to move a node? How we can build a lft,rgt type (The Nested Set) tree with an Adjacency List tree which already we have? imagine there’s a table : id,parent_id,title with 500000 or more records. How can convert this table? First thank you for the post, it’s really helpful. I have a question, maybe a silly one, but in case I have two parents, for instance, following your reasoning, suppose we have Electronics and Home appliance as the topmost parents, so this model would work the same? Just adding another topmost category as NULL? Tks in advance. Yes, you will have an un-displayed parent, and the first two children are Electronics and Home. Thank you so..much for this great blog. Awesome explanation. You are clear my concept of parent , child structure in 2 hours. Is it possible to use the nested set model with intersecting sets? For example, if there is a Portable Television, so it should be a shared child between Television and Portable Electronics. Can the nested set model be applied to such a case? Keep the data on the television in a separate table, and put the primary key of the television in the nested set under television and under portable electronics. I think it would be easy to make a hierarchical table if the DBMS implement a numeric data type as a software version, eg. : 1.3.7.25, so we could use this type to do a column “Hierarchy”, where the first node would be the 1, her first child would be 1.1, his second child 1.2 , the first child of the first child would be 1.1.1, the second child of the first child would be 1.1.2 and so on. To insert correctly in the hierarchy just think in trigger to do it. To delete we could use the “Hierarchy” column to remove a parent and all its children. PS. : It is just a initial idea. In addition; To get the resultset hierarchically just order by “hierarchy”. Really useful article, thank you so much! This is great article. I’m going develop an ORM that will handle nested sets and hide the complexities. Unfortunately most ORMs do no support nested sets and typing all the necessary SQL for managing nested sets in every project that needs this feature is a nightmare. Very useful, as I heard first time about “lft” & “rgt”.